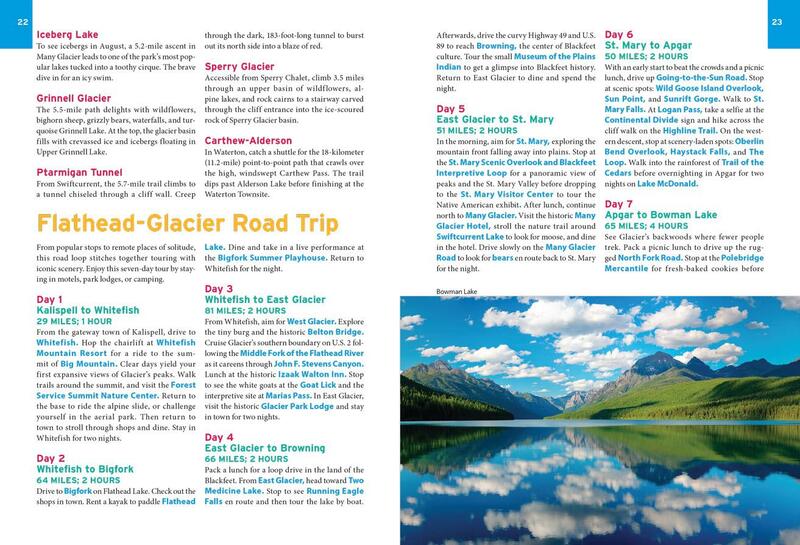 With Moon Glacier National Park's expert advice, myriad activities, and insider perspective, you can plan your trip your way. Hitting the surrounding states? Try Moon Montana & Wyoming or Moon Idaho. Sold by Hike 734 and ships from Amazon Fulfillment. Becky Lomax was three years old when her parents first took her to stay with friends who worked as rangers at Two Medicine Lake in Glacier National Park. During college, Becky worked two summers in the historic Glacier Park Lodge, an easy hop to Two Medicine. She spent her days off hiking, backpacking, and climbing throughout the park. After teaching high school writing and speech outside Seattle, she and her husband moved to Whitefish for quick access to Glacier. 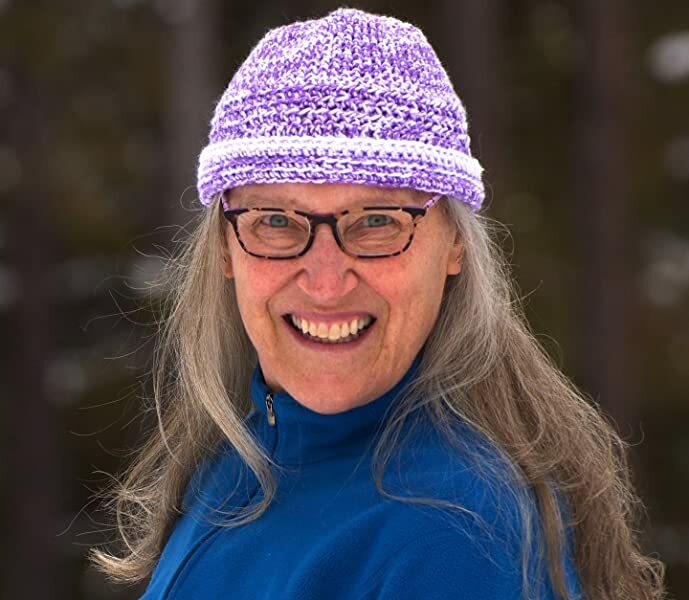 She worked in the park for a decade as a hiking and backpacking guide, leading many first-time visitors to Gunsight Pass, Fifty Mountain, and Iceberg Lake. She also served on staff at Granite Park Chalet, spotting wolverines and bagging nearby peaks in her off time. Today, Becky maintains her strong link with Glacier by using her full-time writing career as an excuse to keep hiking in the park. In magazine stories, she lauds the park's trails, historic lodges, scenic drives, wildlife, and wildflowers. She tags along with biologists in the field to radio-collar bighorn sheep and grizzly bears. She also treks annually to Grinnell Glacier to write about how climate change is melting the park's ice fields. Becky serves as the western writer for On the Snow, a website that provides snow reports for ski resorts. She also writes stories for regional newspapers and national magazines such as Smithsonian and Backpacker. 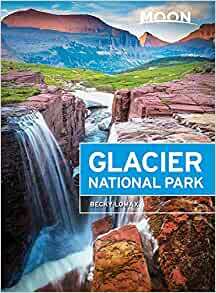 Start reading Moon Glacier National Park (Travel Guide) on your Kindle in under a minute. First of all, I didn't realize how large Glacier is. This book divides up the sections of the park in an user friendly approach. Visiting Glacier can be overwhelming because of the amount of things to see and do. Because of different things that came up, I had to tell myself that we were only going to see one section this trip. And this book helped in choosing what to do and gave great descriptions. Even gave advice on how to drive down Logan Pass so not to put too much stress on your brakes. Guess I expected more details on the trails rather than a narrative about the park. Good info if that's what you a re looking for and the author dedicates a good portion of the book to the Canadian portion of the park BUT it wasn't quite what I was looking for. 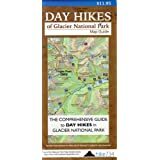 I purchased this guide book for info on hikes, sites, camping and biking in the part. It was very current and up to date. It gave me all the info I needed and more. I found it very helpful. We would not have had as good a trip to Glacier without it. It really helped us in planning our week. We hiked and biked every day. We found good sites in all the campgrounds by knowing which ones filled up early. I would highly recommend it. 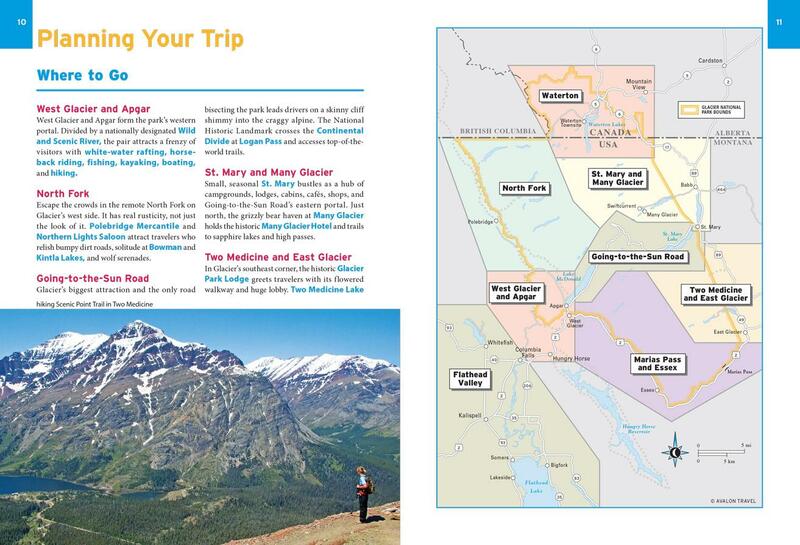 This was really useful in planning our trip to Glacier. My number one tip after the trip is - stay inside the park! You have to reserve a year in advance but it’s worth it- trust me! 4.0 out of 5 starsGreat overall both to make iteneraries before you go. I got both the moon books and falcon hiking guide for both glacier and Yellowstone. I love the moon book series as it has more than just hiking trails. Has road trips, restraunts and more other info. We do moderate hiking so the moon books alone would be more than adequate. If we were doing 2 or 3 day hikes then the falcon serious would be good. However it is nice to have both to reference. Best guidebook I have used. All suggestions were great, as the National Parks are having record attendance the advise on when to get places early was helpful. 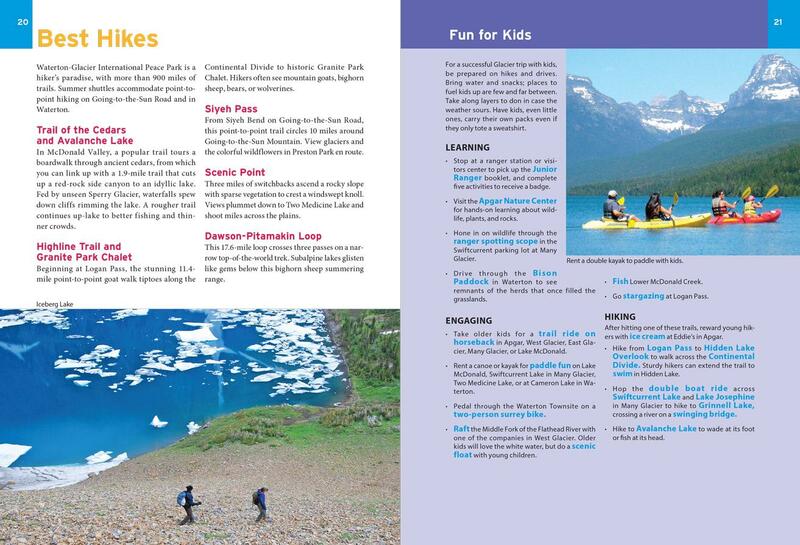 Will look for Moon guides for all future park trips. One surprise was how well the food recommendations were. The places recommended by the book were all great even if I would not have chosen them otherwise. Places tried outside the book we wished we had tried somewhere in the book. Well organized and easy to use. 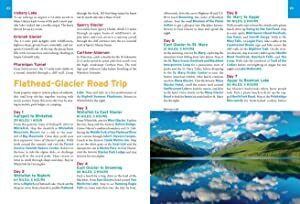 One of the daunting task about planning a trip to Glacier is the overwhelming amount of information that's available in print and the Internet. It's a little bit like planning a trip the Disney World for the first time. This book is very helpful in that it divides the park into the specific regions, and allows you to plan your trip based on which region you want to travel in. It lays out lodging, hiking, and activities in each of the key regions. 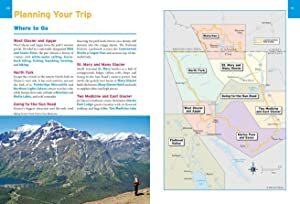 Since the park is so huge this is a great way to approach planning your trip. 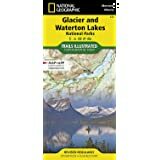 As a first time traveler to Glacier, this is the first book I found that really made sense and allowed me to begin planning for a weeklong vacation. The book is a handy travel size to bring along. Some of the information in each of the sections is a little redundant. We just returned from Glacier. This book is well organized and stocked with tons of information that is accurate and up to date. I don't know if this book comes in a digital format but I would not bother looking for one. The nice thing about a print format book in the wilderness is it does not need batteries or charging. Bring the Moon with you to Glacier.